It’s been another week filled with lots of appointments but you know what’s good about all those appointments, down time. 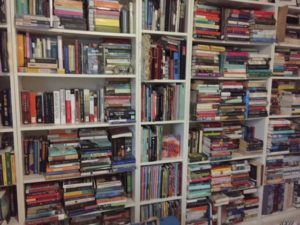 So while waiting for some car maintenance or in doctors’ offices I’ve been able to catch up a bit more on my reading and I thought I’d share an update on the books I’m currently juggling. Whispers Beyond the Veil by Jessica Estevao. This mystery features Ruby Proulx, a young woman on the run from the law who goes to stay with her aunt. Her aunt owns the Hotel Belden, known to cater to spiritualists, and Ruby will try to fit all the while hoping the law doesn’t catch up to her. This has been a fun historical mystery so far and I’m curious to see how Ruby is going to get out of the bind that she finds herself in. The Best Kind of People by Zoe Whittall. The story is about a beloved teacher who all of a sudden finds himself being accused of sexual misconduct. A tough subject and one we keep hearing about a lot lately so it’s interesting but I’m not sure how I feel about this one even though I’m half-way through it. I think partly it’s because there are various perspectives. I’ve read about the main character, his children, his co-workers but the characters who I’ve yet to hear from are the victims. Death in the City of Light by David King. I’ve only started this one today but so far it’s a gripping story. I picked this up for Nonfiction November and am just now getting to it. It’s the true story of a serial killer during Nazi-occupied Paris. When I read nonfiction, true crime is rarely my choice but this just sounded fascinating. So what are you reading? I’ve got a few other appointments to take care of tomorrow so I’ll be taking one of these with me. Looking forward to spending a weekend with these books and catching up with you. Have a great weekend and let me know what you are reading! They all look good especially the David King. Crime thrillers are a favorite genre in books and movies. I just finished watching season 1 of Mindhunter on Netflix, it was very good about FBI agents in the 1970’s who interview real serial killers in order to try and find clues about current cases. Reading wise I’m almost done with Pretty Girls by Karin Slaughter, which is also really good. Happy weekend and hoping the appointments go by quickly for you. B00kworm – I’ve heard of the Mindhunter and was interesting in that one. Glad to hear you enjoyed it so maybe once we are done with our current viewing choices we can hop on that one. I do want to read Pretty Girls – that one has been getting a lot of attention hasn’t it? Jenclair – I love the time period and it’s an interesting set up but my reading has been slow going lately so I need to just devote some time to this one and I should be able to finish it soon. All the books sound interesting and I hope you enjoy reading them, Iliana.